Plant-based, meat-free, gluten-free, dairy-free, vegetarian, vegan, flexitarian – so many buzzwords! It’s a changing World. Adopting a more plant-based focused diet as a lifestyle change is a growing trend, as is the number of people giving up meat, gluten, dairy and also adopting a vegan lifestyle. There is so much posted on Social Media and new products to try, whether street food markets, cafes, restaurants, supermarkets and independents in the U.S. , U.K. and globally. We love cooking and eating vegetarian food and have made a conscious effort to cut down our meat consumption too, although not putting a label on it! 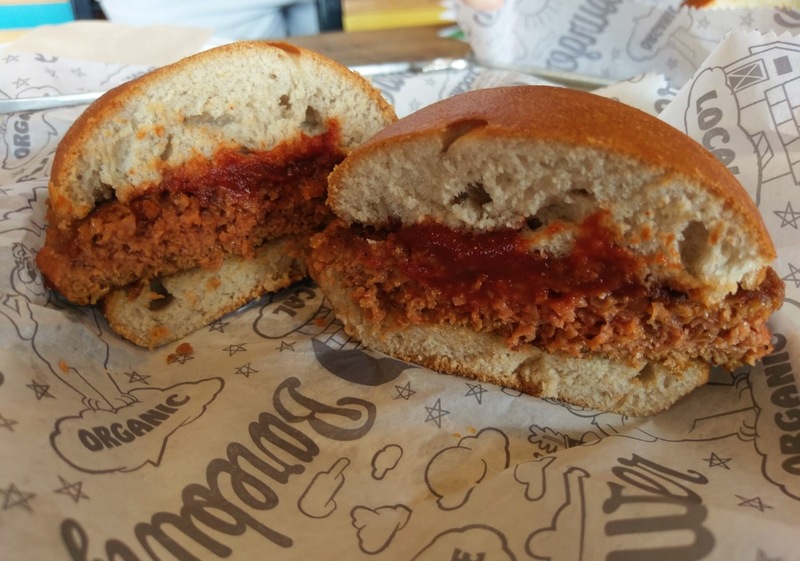 We decided to check out some plant-based burgers at Simon’s local Bareburger in New York. 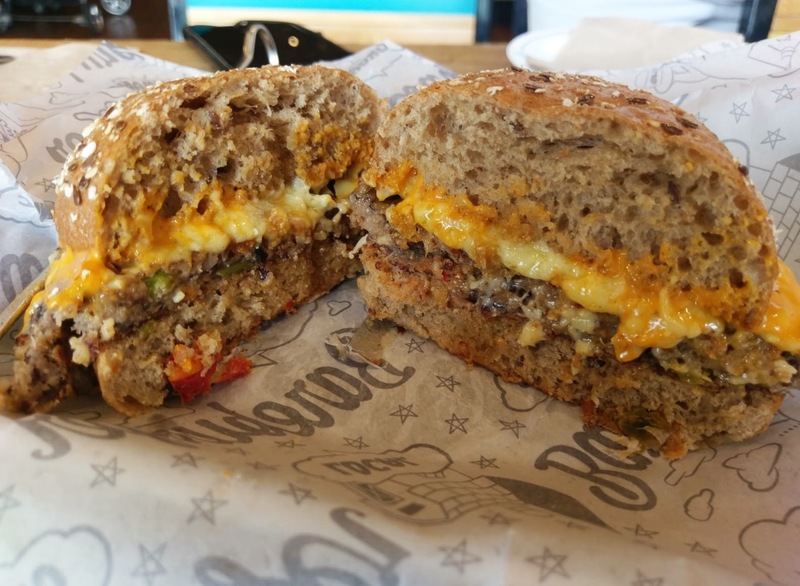 With so many options on the menu we thought we would keep it Classic and go with Impossible Burger, Beyond Burger and a Thai Chia: one of Bareburger’s in house veggie burger combos. Lots more in house combos or build your own burgers to choose from whether you are a vegan, vegetarian or a meat eater! It was my last meal in Westchester County, New York before I drove back to Newark airport to fly home to London. Simon was also busy with family stuff so we made a quick decision to go with only a small number of relishes and condiments so we could focus on tasting the burger. We cut them in half to look at the appearance before munching away for our taste2taste test! So how did they taste? We were impressed with the flavour and textures of all three. The Thai Chia patty you could see and taste the green peas and had a slightly grainy texture from the quinoa and chia, very filling. It reminded us a bit of the veggie burgers we ate in Vegetarian restaurants such as Cranks in London. We liked the layers of flavours from the Thai spiced ketchup in particular. Both the Impossible and Beyond burger had a more meat-like texture and look. We enjoyed both. 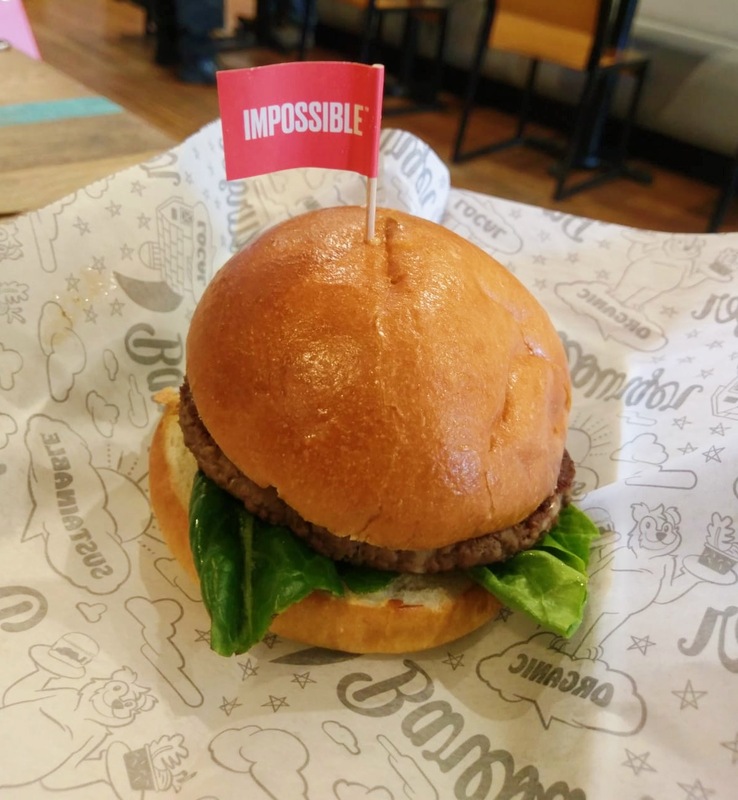 Simon said that if he visited again with his ‘tweenage’ son, ordered an Impossible and a Beyond burger without mentioning they weren’t made of meat , his son probably wouldn’t notice! Simon did visit Bareburger again recently and although he did let his son in on the secret, he said that his tweenager really liked the Beyond Burger finding it quite close in taste and texture to meat and it especially worked well in vegetarian stance with American cheese, salad leaves, tomato and ketchup! 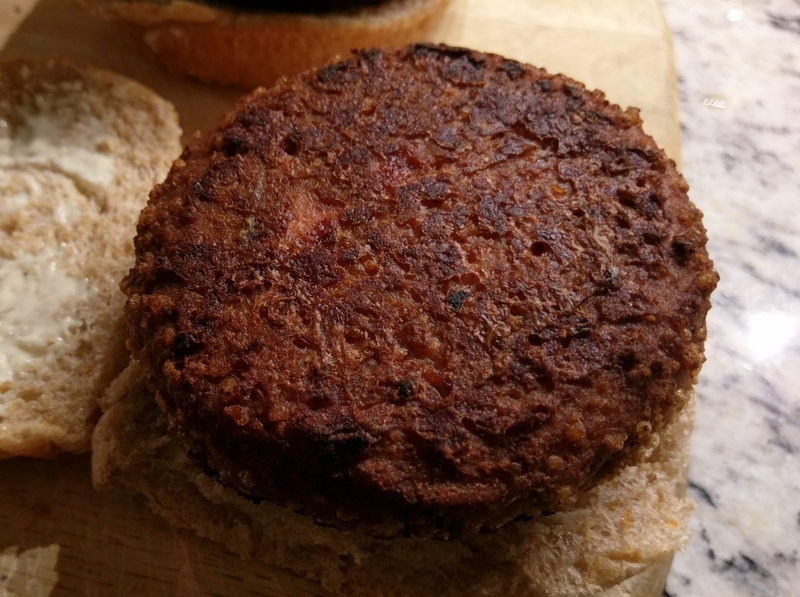 It got us thinking should a plant based meat alternative burger taste of meat ? We asked a few friends : vegan, vegetarian, flexitarian and meat eaters. We also polled our Yotam Ottolenghi Housewives FB Group foodie friends. There were lots of different views. Friends who were vegetarian/vegan because they didn’t like the taste of meat were clearly not fans, preferring something like a Portobello mushroom ‘burger’. Some non meat eaters both vegetarian and vegan, who did miss the taste of meat would consider eating on occasion. Our YO Foodie friends who love cooking lots of different cuisines and are fans of both plant and meat based recipes were mostly in favour of veggie burgers tasting of veggies, although one or two non meat eaters would consider eating. My local running shop manager, an ethical vegan for many years said it’s not something he would personally choose to eat. However if it was a vehicle for people to enjoy, that involved less animals being killed he supported the principle. 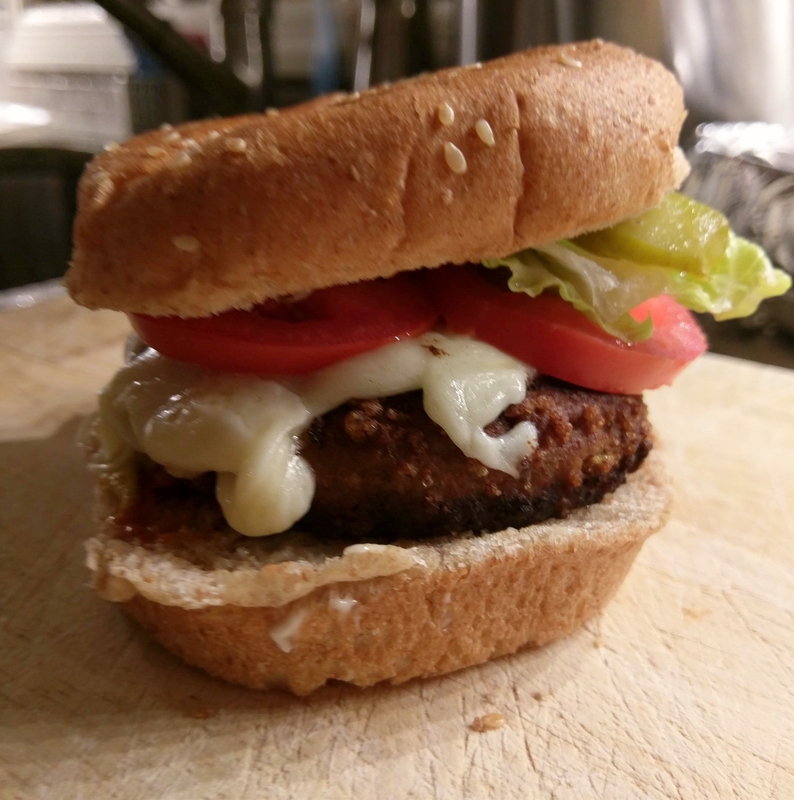 Another neighbour of Simon’s also a vegan and a food entrepreneur again thought an interesting innovation, preferring Beyond Burger, as a lighter texture, not leaving him with that ‘carb heavy’ feeling after eating. 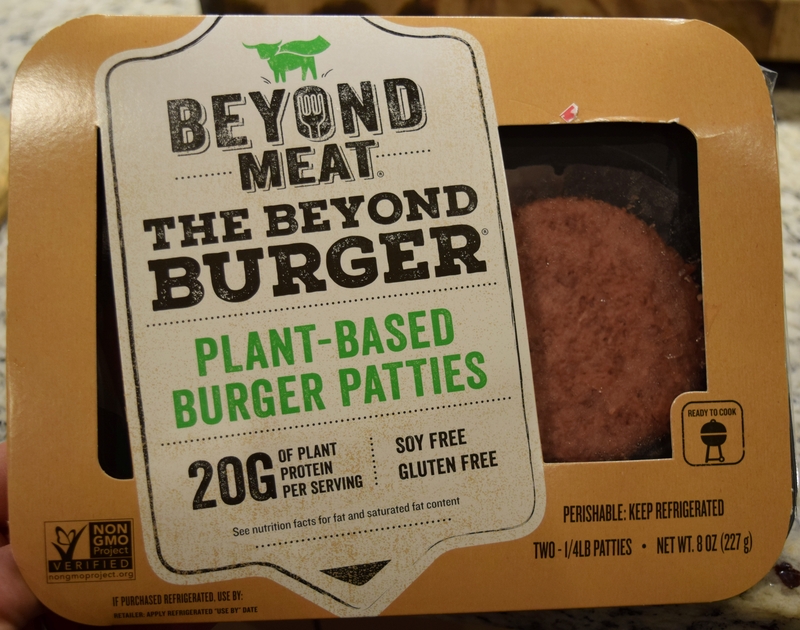 Although he wouldn’t personally choose to eat something with the appearance flavour & texture of meat he pointed out that Beyond Burger is marketed towards meat eaters wanting to eat less meat, more plant based meals. Simon also bought a pack of Beyond Burger patties to cook at home. 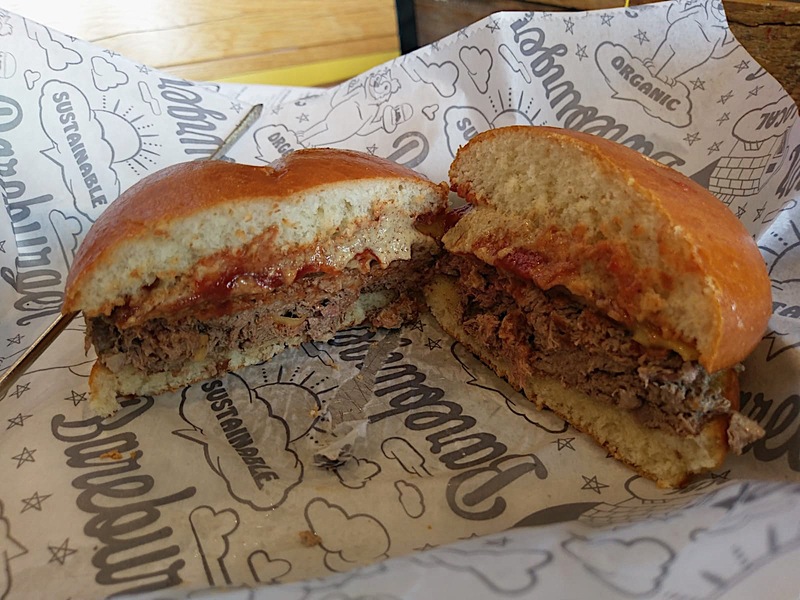 So we enjoyed doing this taste test and enjoyed all three options however felt the Impossible burger just edged it on overall flavour, texture and eating experience. 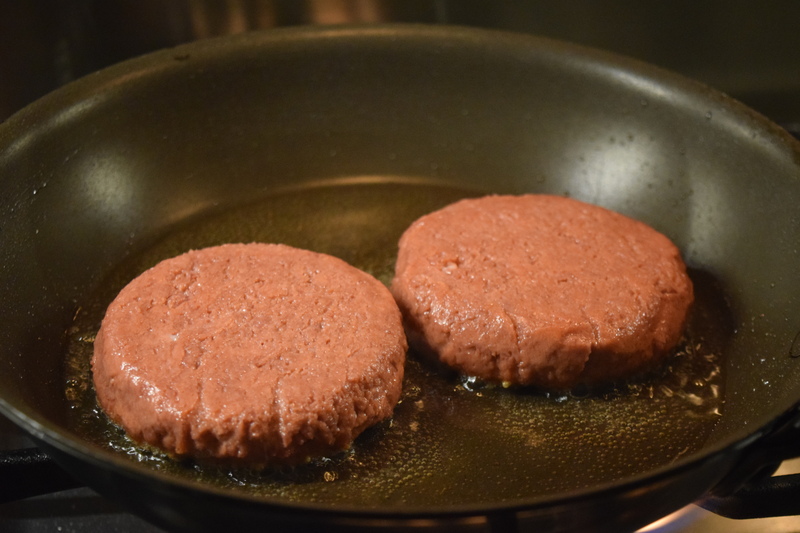 The Beyond Burger is also widely available to buy in U.S. to cook at home, and in U.K. too in Tesco’s Supermarkets and at Honest Burger Chain. As transatlantic foodies, we share foodie finds: markets/ cafes/ restaurants. We create and try recipes in New York, London and on our travels. We don’t often get to eat together but had the opportunity during our recent trip to Israel for friends Lena and Albert’s wedding. 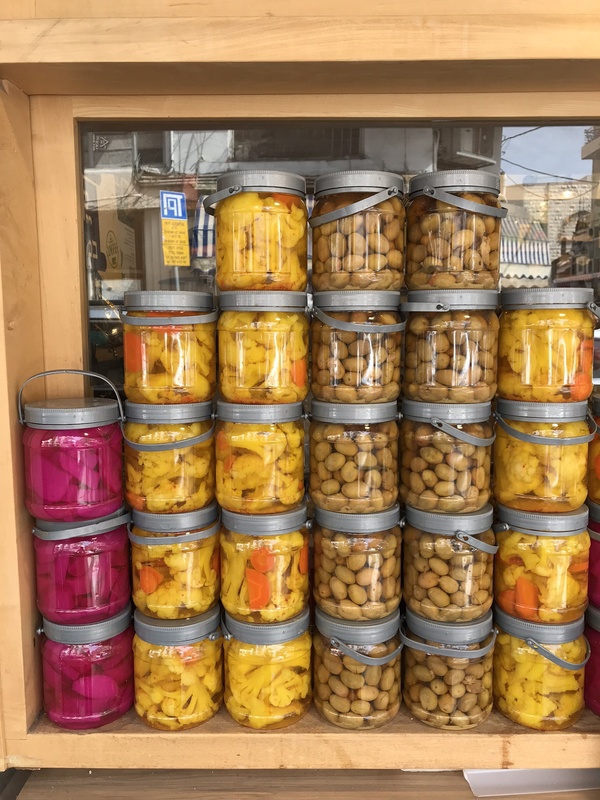 Neither of us have been to Israel for a very long time, and it was fantastic to discover the current vibrant food scene in Tel Aviv and Jaffa. 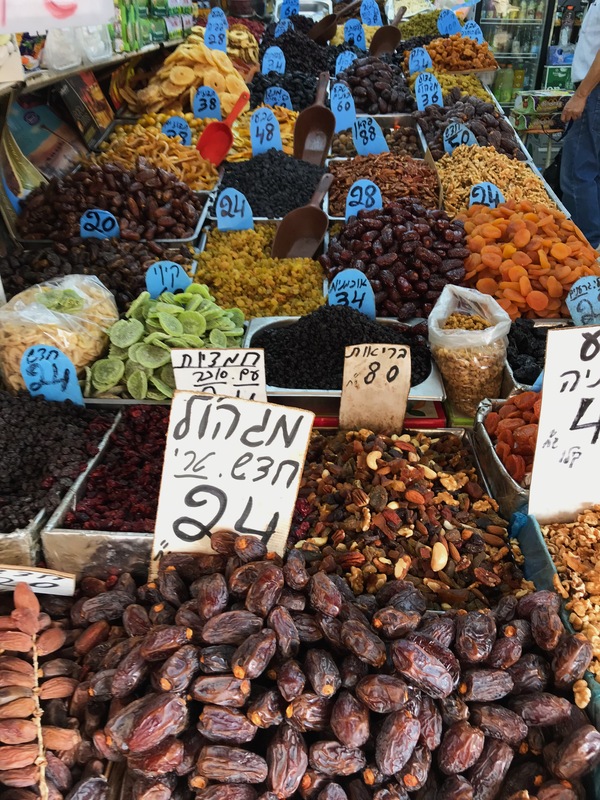 Israeli and Middle Eastern Food is really on trend in USA, UK and globally with chefs such as Yotam Ottolenghi, Sarit and Itamar of Honey & Co in London and Mike Solomonov in Philadelphia, Israeli chef Eyal Shani with Miznon in Tel Aviv, NYC, Paris, Vienna and Melbourne. Too many more to mention as part of the London, NYC and global food scene. 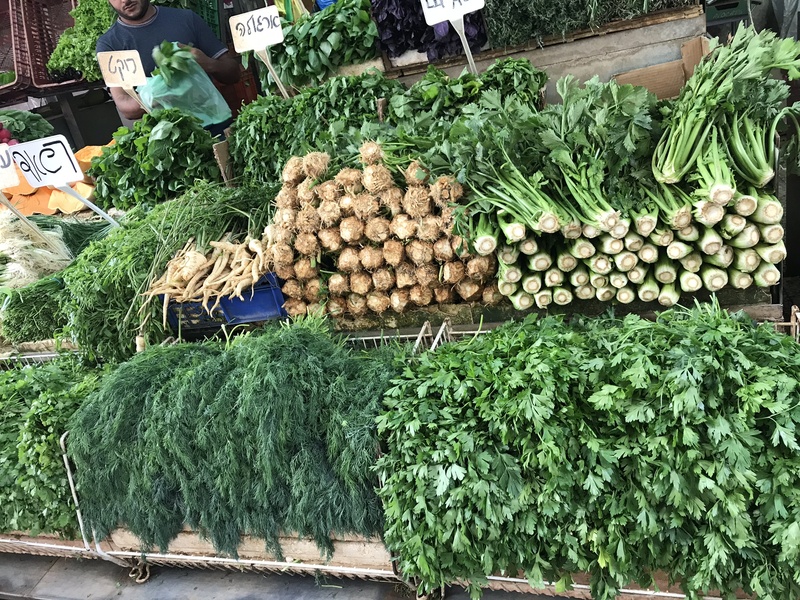 Tel Aviv has a growing global reputation as a ‘Vegan City’ with a fantastic choice of vegan and vegetarian places to eat. After all many of these recipes have always been an important part of the cuisine – think falafel and hummus to name two! We thought we would share our top 5 foodie highlights. Simon’s favourite: Passionfruit with everything! 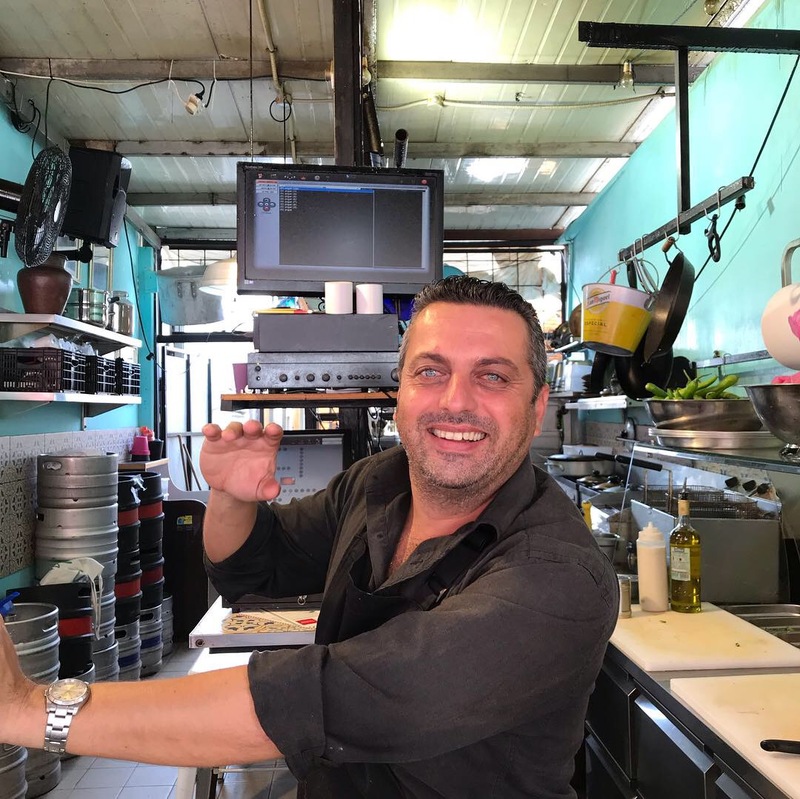 Simon is the juice man and couldn’t get enough of the scene with little juice stands dotted all round Tel Aviv, especially as his favourite fruit, passion fruit, is in abundance in the City. 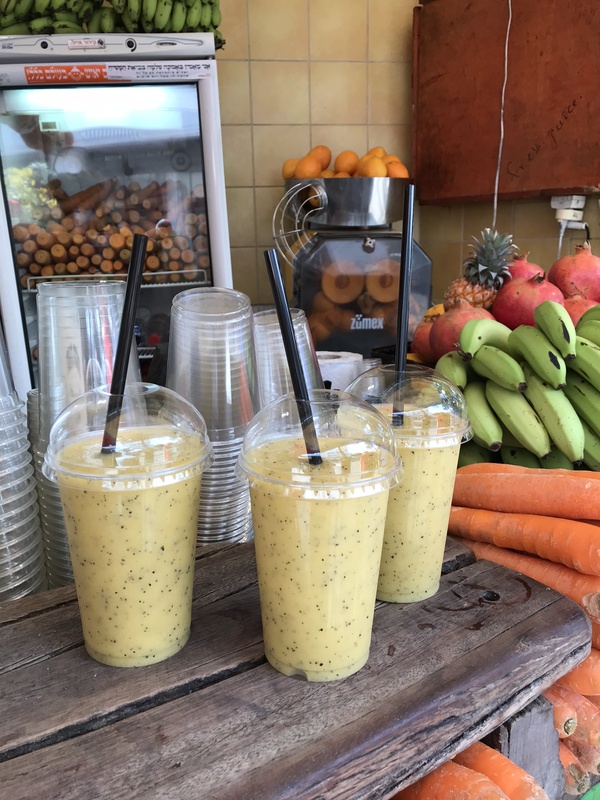 We met Itzik Mitzik founder of La Fruiteria who made us a bespoke juice combo after asking what fruits and flavours we liked and what mood were we in. 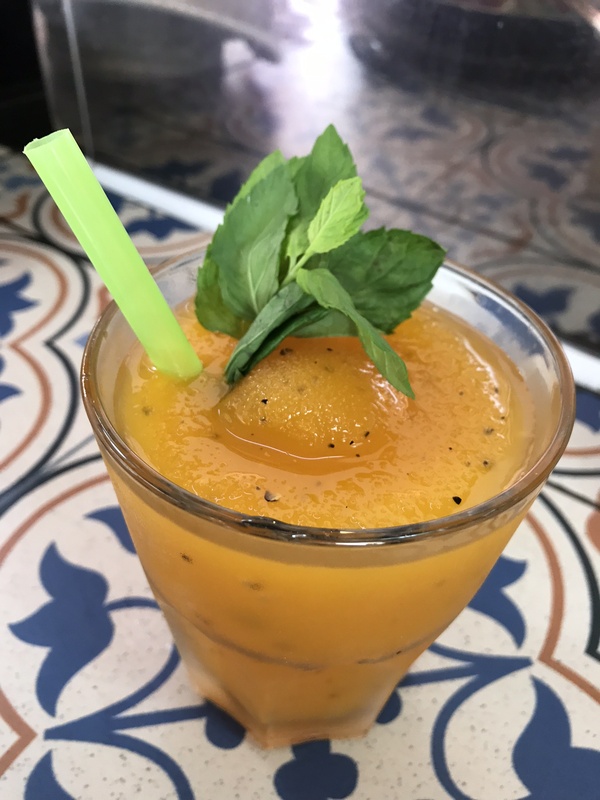 Having walked around sunny Tel Aviv for a few hours, we were in need of a refreshing pick me up in the afternoon before getting ready for the wedding in the evening. 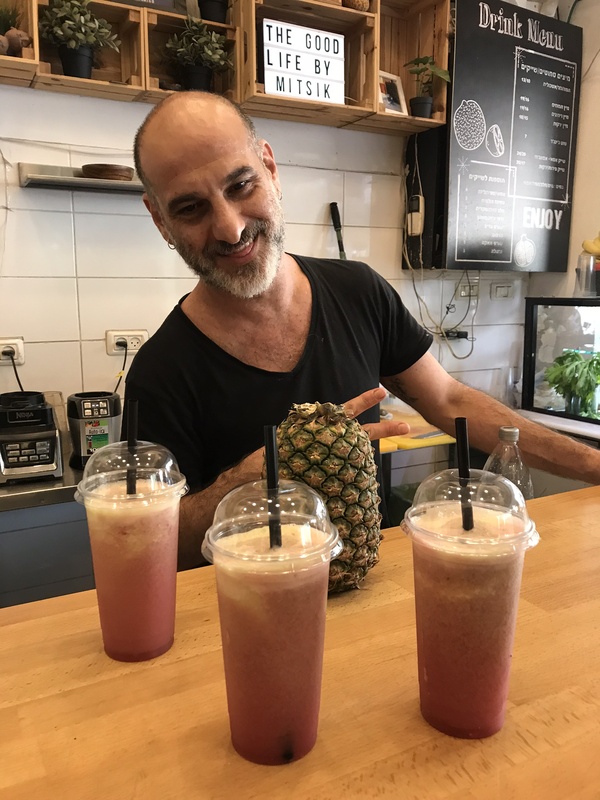 Itzik made us a fab refreshing juice combo of pomegranate, red grapefruit, melon, pineapple & ginger- just what we needed to quench our thirst ready for a full-on night of celebrations! 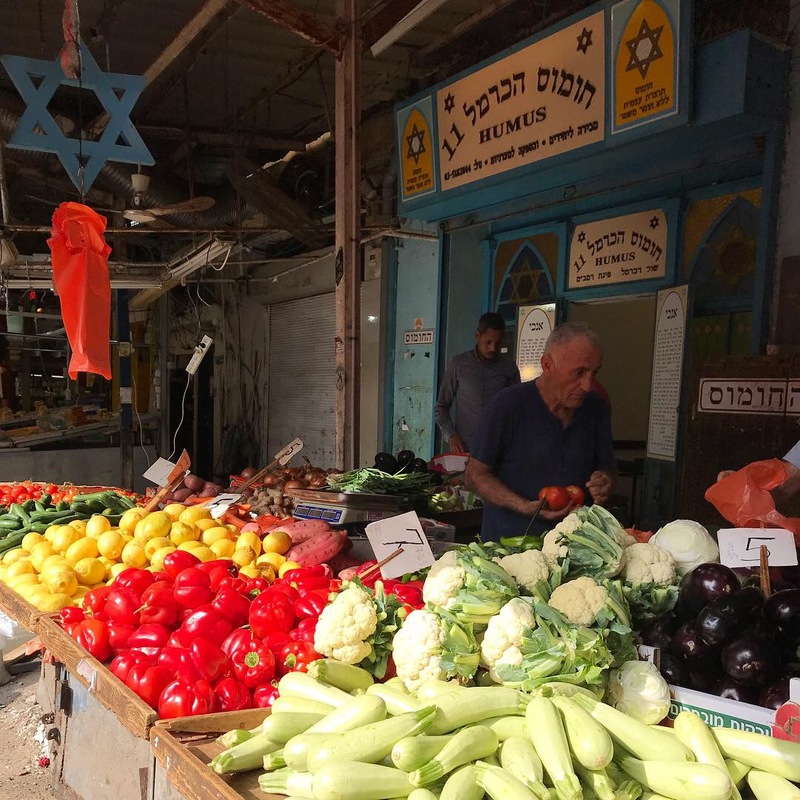 We had a Sunday morning meander around the Carmel Market in Tel Aviv taking in the sights, sounds and aromas from all the food stalls – more of that later. 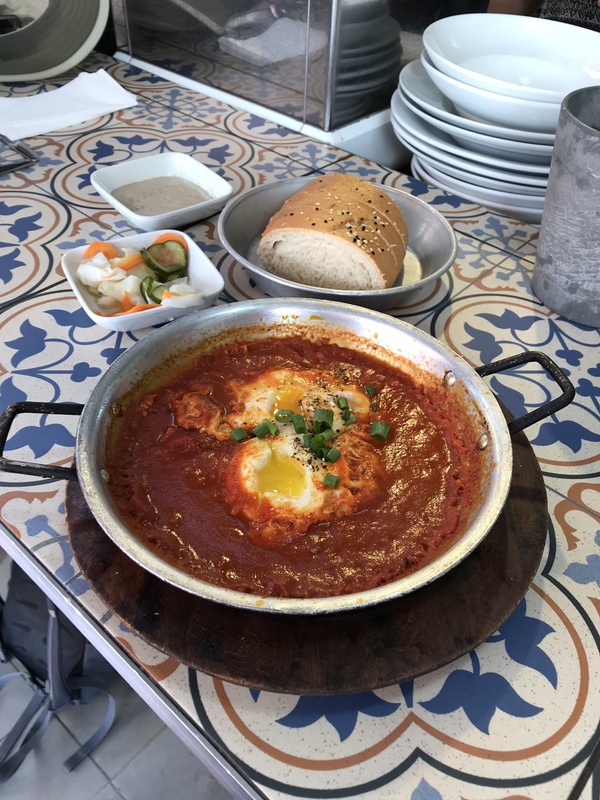 Sunday breakfast just had to be… Shakshuka. It’s a really popular breakfast/brunch dish that can be found in many trendy all day dining spots around the World. We found a little cafe within the market called rather handily, ‘Shukshuka.’ We had the classic combo with fresh bread from the market, pickles, juice and coffee. Also a great chat with Ari the owner about the local Tel Aviv food scene too! Give us a wave Ari! The Carmel Market is probably the most famous being centrally located and sells an array of food, clothing and gifts. We focused on the food. Lots of halva, breads, spice mixes, fresh fruit, veggies, juice & vibrant stallholders enticing us in with their market patter! Spice mixes for every dish! One highlight was Dr. Halva and we couldn’t resist trying a few including, no surprise, passion fruit, Simon’s favorite! Lindsey purchased passion fruit, pistachio and pecan for foodie gifts and future baking projects: Ottolenghi tahini and halva brownies and Honey & Co Babka in the planning. Get your Greens at Carmel Market! There were also many great places to eat nearby, that source their ingredients from the market. 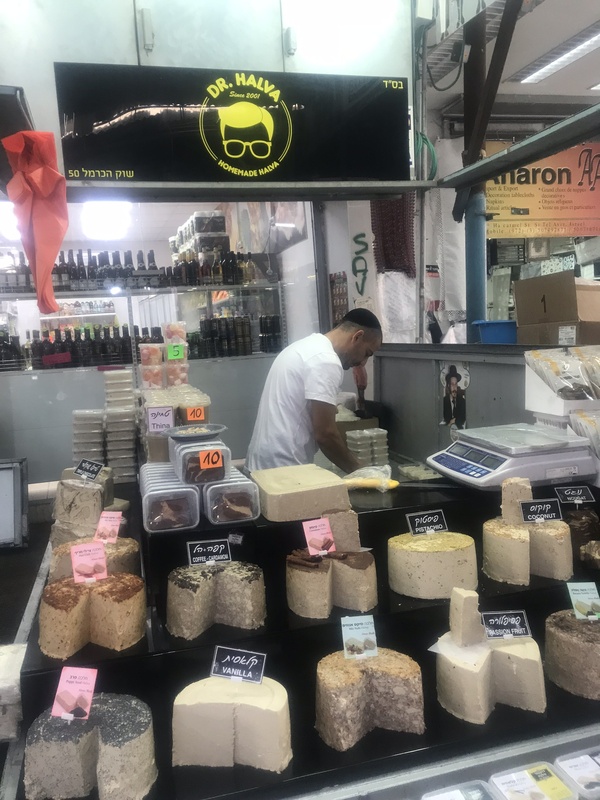 The Levinsky market in Florentin District, South Tel Aviv was recommended by a foodie friend and chef Emma Spitzer and has more of a local market vibe. The market developed in 1930’s when the Greek immigrant community started selling spices, nuts and dried fruits from The Balkans. Today this area has developed into a vibrant foodie destination with the business owners selling a wide and fantastic range of foods from the Levant, reflecting the Iranian community that settled in this area and wanted ingredients to cook the Persian recipes of their heritage. Lindsey visited on a Monday morning, it felt less touristy than Carmel but maybe that was just the day she chose to go. 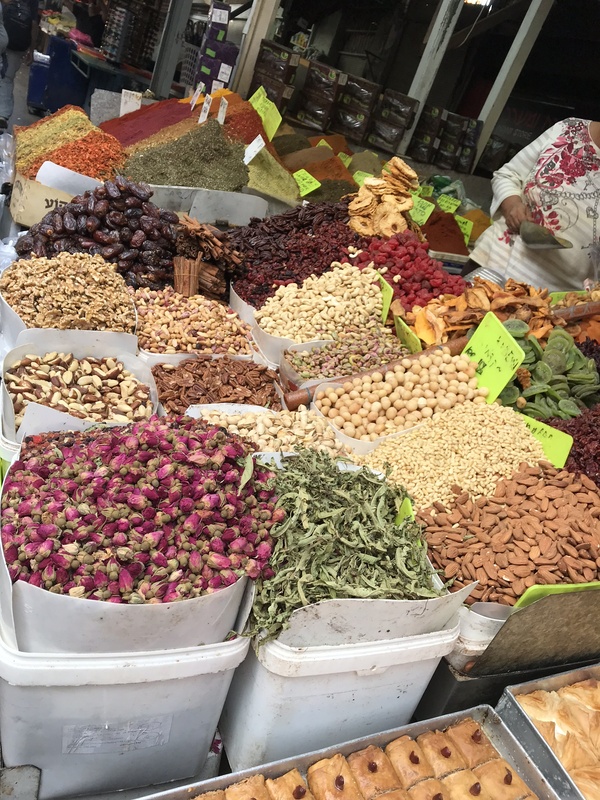 Lots of shops selling dried fruit, nuts, spices, pickles all beautifully displayed and enticing to buy. Working out how much room left in the suitcase to fit everything was key! Lindsey bought dried chilies, dried rose petals and some spice blends and also acquired nutmeg, which proved a challenge. However, with the help of a translation app, a lot of smiling and gesticulating she discovered its alternative name muscat! 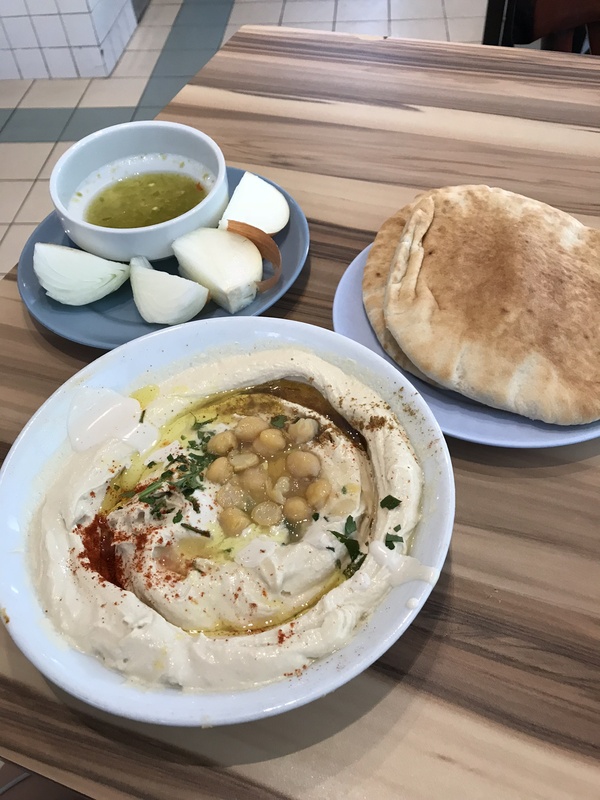 There were lots of interesting cafes and restaurants by the market but Lindsey had a hankering for hummus and a destination in mind…..
4. 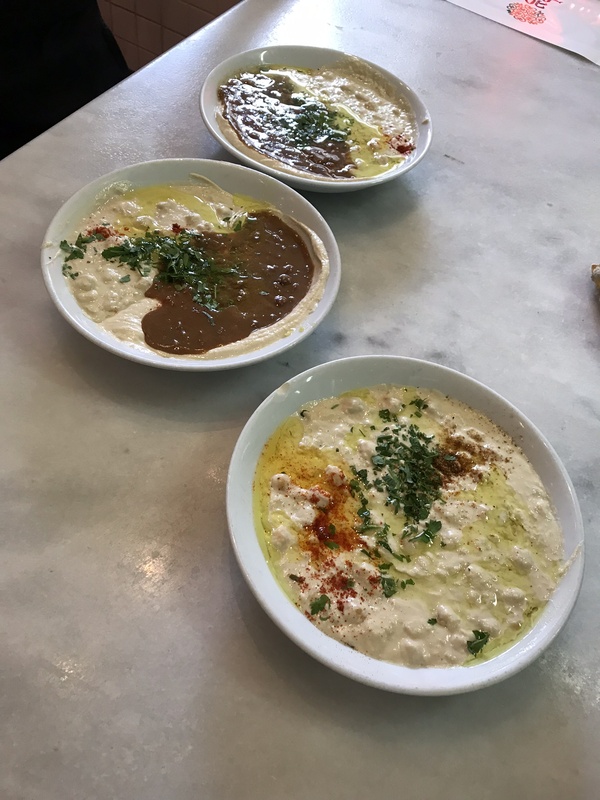 Abu Hassan Hummus, Jaffa: the best Hummus in Israel? 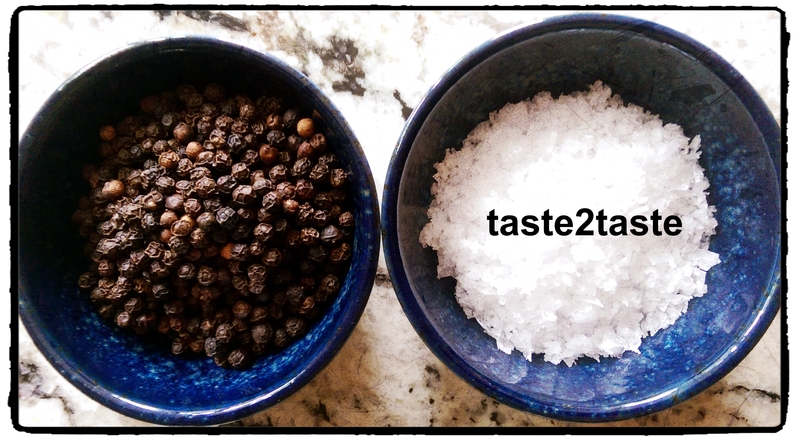 We read a lot of articles, opinions and recommendations but food is so emotive and subjective, after all, our blog taste2taste is all about 2 friends having 2 opinions! 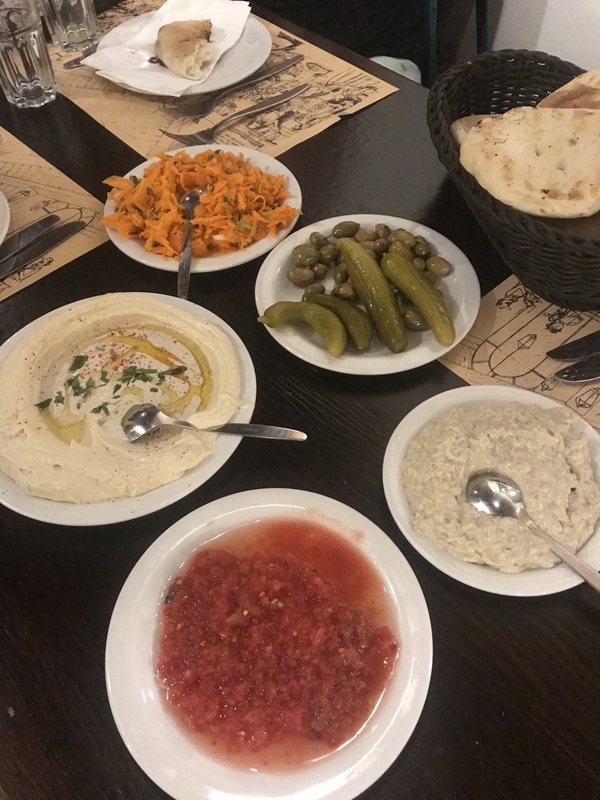 Emma and others recommended a trip to Abu Hassan in Jaffa. It was really worth it! After Levinsky market Lindsey was ready for lunch and a walk around Jaffa. When she found it, the place was busy but thankfully no queue and she grabbed the last free table. No menu! So, Lindsey kept it classic trying hummus that is dressed with a few boiled whole chickpeas / garbanzo beans, spices, olive oil, parsley and served with fresh pitta bread and raw onion petals quartered. Lindsey had never eaten hummus dipping the raw onion layers before but had to try and it was delish! They also make a chunkier hummus, Masabacha, served similarly or with brown beans. Also falafel and that’s it! So 4 options or a mix of all done incredibly well. The hummus was creamy, flavourful and seriously some of the best Lindsey had ever eaten – the hype was right! 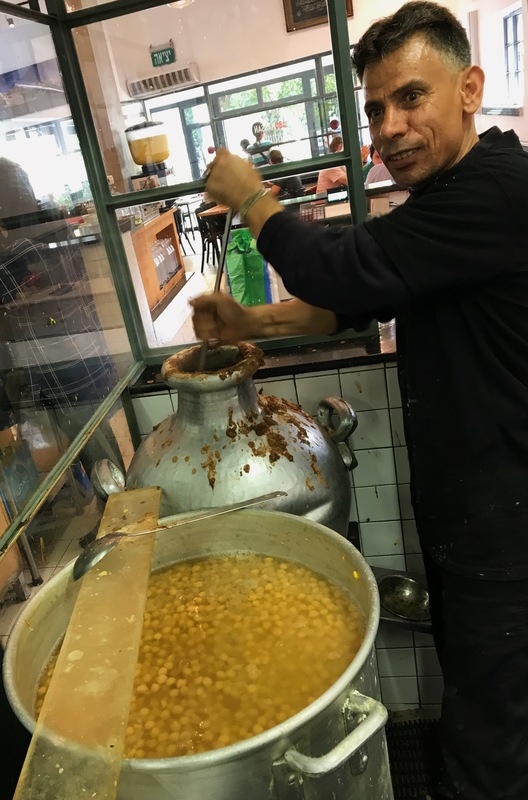 Chickpeas & brown beans .. stirring the pot! She managed to get to see the kitchen with the tubs of hummus made earlier that morning, the big pans of cooked chickpeas, brown beans and the preparation station where all the toppings are added- great theatre and lunch. We spotted this place on our way down Dizengoff Street en-route to our friend’s stag party, at a nearby local bar the night before the wedding. 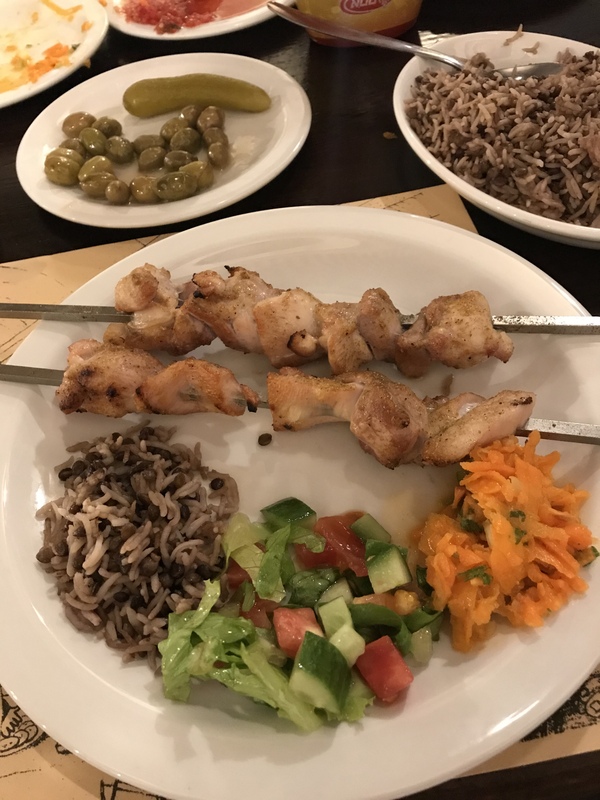 It was jam packed with every table on the pavement around it heaving with families and friends tucking into meaty flat bread parcels and salads. Simon suggested we try it out as we thought we might need something substantial to eat before the stag night drinking began. We both went for the fully loaded veal and chicken thigh shawarma in a huge puffy laffa bread (a flat thick pitta style bread). This was pasted with spicy Harissa (a hot pepper sauce) filled with cabbage, classic Israeli tomato and cucumber salad, assorted pickles, amba (mango pickle), tahini and a veritable pile of steaming hot crackling meat wrapped and served. Somehow, Simon managed to eat his entire shawarma, which was over a foot long! We proceeded to the bar where, Albert’s cousin Yossi, was leading the festivities encouraging the Groom to have a drink or dozen. The local hooch is called Arak (similar to Ouzo, Raki, Sambuca or Pastis from Greece, Turkey, The Balkans, Italy or France respectively). It is an aniseed based spirit. With Yossi calling out ‘shots, shots, shots’ and ‘arak, arak, arak’ endless glasses of this clear potent liquorice tasting drink were delivered. Sadly the groom was so petrified about being drunk on his wedding day, Simon and Yossi couldn’t persuade him to partake of more than a couple of drinks! The night after the wedding party, Simon’s niece, who had recently made Aliyah (emigrated) to Israel needed to meet up with him to pick up a parcel he had brought from her family in the US. We decided it might be fun to go out to dinner with her somewhere off the beaten track. After a few minutes on our cell phones, we identified a couple of potential places to try out. One of these was a little off the regular tourist trail in Kerem Hatemanim, the Yemenite neighborhood of Tel Aviv. After wandering in the humid evening through some fascinating back alleys with run down Bauhaus style concrete buildings street art and stray cats meandering about, we found ourselves in an area with back streets buzzing with people eating alfresco and located Maganda, a Yemenite restaurant whose hospitable owner, a former paratrooper, sports the most amazing white beard! Although tempted to try such traditional Yemenite delights on the menu, such as: calves feet soup, ox testicles and lungs in sauce, Simon’s niece, who is less of a foodie, persuaded us to go down a more standard route, the highlights of which included a fabulously executed subtle spicy Yemeni carrot salad and perfectly cooked skewers of lamb & chicken straight from the grill. So many more places to check out but sadly we ran out of time. There’s a great reason to go back and explore some more. What are your favourite Israeli places ? 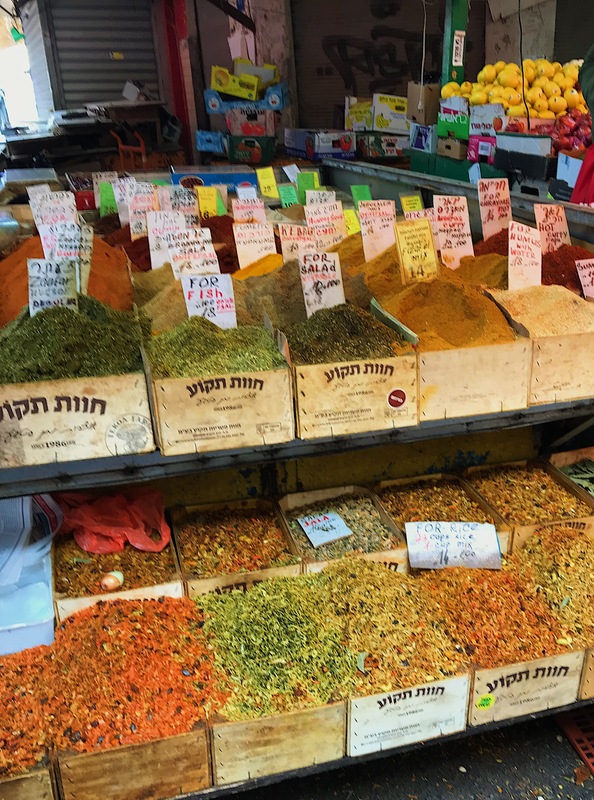 We would love to hear your recommendations and Israeli Food Adventures.